There are rumours circulating that an embattled, deceitful and thoroughly discredited pontificate - at least discredited among faithful Catholics following events carefully - seeks to draw the clergy of the Holy Catholic Church, by coercive means, into a new vow of obedience in particular to Pope Francis and his own 'unique' Magisterium. I shudder at such rumours. Are these rumours true? We do not yet know. How do such rumours evolve? Who wishes these things to circulate? Are they credible? Should it be taken seriously? Only the last question can I answer and only with an opinion. I fear so. I believe clergy have reason, based on their own observation of five years of laughably less than transparent conduct within the Vatican, to be on the alert at least. The new rumour suggests that this pontificate - one in which the use of reason as a faculty has already been 'taken down a peg or two' during the intra-ecclesial 'dialogue' concerning Amoris Laetitia - is considering the nuclear option of going for broke and enforcing loyalty to a dictatorship of relativism in the Vatican. Would that really be surprising? Not really. But would Francis contemplate going down that road? He has already said 'I might be the Pope who splits the Church', a throwaway comment that made it sounds like splitting the Church and causing global schism was a bit like ordering food at a Roman trattoria. 'I might have the cod, or I might have the steak. Oh no, I think I might split the Catholic Church instead.' That this pontificate has sclerotic, schizophrenic but, most pointedly, psychotic tendencies has become quite apparent over the course of time, not that the Church has never seen 'psycho Popes' before. Anarchy rules in Rome. Yet, there is more than simply this to understand about this papacy, since there is simultaneously the most aggressive and to some extent the most effective and consolidated PR campaign in Church history going on, even as I type, and it is in the complete and total service of the Pope and his reputation. Christ our Lord is not a major beneficiary of this extensive publicity campaign, but we have after five years expected very little to come from the Vatican that lauds and honours the Church's Lord and Head. As 'M.A Colonna's' The Dictator Pope made clear, the most disquieting aspect of this pontificate isn't simply that this Pope is something of a thug, with contempt for his critics, for if he were only a thug, the whole world could see it, but rather that this pontificate seems to involve a mafia boss, one desperate to consolidate his power base while living among his enemies, who manages to twist and discredit the message of Jesus Christ while appearing to the majority of the world as a very kind man who is nice to the poor, who kisses babies and visits the sick, imprisoned and elderly, thus making him appear to be saintly and all the while doing it with a cameraman by his side, you know, like all the Saints did. The truth is that real mafia bosses do not need to go to such great lengths to reinforce the image of their inherent goodness to all and sundry. Such men display greater sincerity perhaps than Francis, because, in fact, they are feared because they are dangerous, not because they appear dangerously virtuous to the public, while being cruel and scheming in secret. Within the walls of the Vatican, Francis is feared because he is terrible and has grown powerful, not because people are afraid that he might drop round and kiss their sick grandmother. In truth, no good deed of Pope Francis goes undocumented now, and hasn't for five years, because such deeds are clearly needed to reinforce a PR message that the Pope is wonderful and beyond reproach. It all serves as wonderful cover and camouflage for a man seemingly without much faith in the actual words or mission of Our Lord to save souls and bring the Truth to those who need it, whether they wish for it, or not and even better cover for a psychopath to abuse his Office. If I were to suggest one reason why The Dictator Pope has the Francis Team worried, it is that such a document puts something of a break on the canonization attempts that will be a natural consequence and reaction to the day when His Holiness dies. For his changes to be permanent, the mafia need Francis to stay relatively unblemished in the eyes of most of the Church so that his changes can receive 'sanctification' with his reputation for mercy. And yet, even as Francis's canonization day remains a possibility - could it be the date of his annual address to the Curia? - there is another aspect to this pontificate which has become stridently clear. Criticism - even stinging criticism, even criticism that rebukes the thuggery involved in this most unique of pontificates, even criticism that levels charges of corruption against Francis's allies, or against Francis himself, is dealt with by a stunning reaction of near total silence, silence from those who should be in some way embarrassed or ashamed. It is almost as if no amount of truth or scandal can hurt those who now enjoy the benefits of power. For Pope Francis, his overwhelming desire (and the desire of those who surround him) seems to be to ensure that his personal reputation is impeccable even while insulting the faithful or castigating priests, or sacking good men, or instigating a global movement within the Church for abandoning Christ's teachings in favour of his own, or selling out the Pontifical Academy for Life to globalist eugenicist monsters. In fact, one could say that the damage Francis does is contingent to his excellent PR team, and is perhaps dependent on it. But the sheer level of deception that is going on during this pontificate is staggering, mind-blowing in fact, if you take into account that the push for the Kasper proposal which has wreaked such havoc already upon Jesus's Church must surely have been planned well before Francis's ascension to the Throne of Peter, because he talked about how wonderful Cardinal Kasper and his book was the very morning after his election, at his first Angelus. There was no waiting around. On day one of his pontificate, Francis was already stealthily undermining the Lord Jesus Christ and His teaching on divorce and remarriage and was busily prepping us for his earthquake Synod, at which the Bishops of the world were, like the Catholic faithful in general, ignored and the Kasper proposal, voted down by the Bishops, was retained by Francis in his Apostolic Exhortation by virtue of a single footnote. This pontificate is all about smoke and mirrors. Nothing is as it is presented to be. The Synod on the Family was the Synod on the Destruction of the Family. The Apostolic Exhortation Amoris Laetitia was bereft of much that could be described as Apostolic. An oath to the 'Magisterium' of Pope Francis will, should it come about - not be an oath to Jesus Christ and His teachings, but more likely to the personal interpretation of the Gospel of the man, Jorge Mario Bergoglio, who has distanced himself from the Church's tradition and distanced himself even from the Word of God. If Pope Francis doesn't care if the entire faithful wake up and smell the coffee in terms of the fraud being perpetuated against them, he does care whether people realise this while he is Pope. This is probably the only thing Francis fears. Will people realise? It is, sadly, not likely since far too many Catholics are disengaged and far too many would see no problem with apostasy, many would not even understand the relevance or meaning of the word in terms of their faith. Readers, you who are firm in the Faith of Christ, we need to be mentally equipped for a hard reality. Francis and his team have probably taken the Church's pulse and it is likely he sees that it is so weak he can get away with anything. Take heart, we'll always have Poland! Deo volente! And yet, there is more to the Church's most unfathomable Pope even than this, because even when it becomes increasingly apparent that Pope Francis is psychologically unstable, given to massive temper tantrums when his personal will is thwarted or contradicted, deals contemptuously and spitefully with those who work in his service and stands accused of allegedly using money from Peter's Pence to support the campaign fund of his favoured political candidate during the US election, the abortion supporting Hillary Clinton, in the mainstream media Pope Francis finds very few critics. This is because - or if I may posit a theory - wherever Christ is persecuted and sidelined, marginalised or dismissed from public life, even life within the Church, wherever He is treated with contempt, scorned and derided, all of his enemies will gather together and work together to achieve the outcome so wished for by His enemies, enemies spiritual in nature, enemies who once were angels and now are devils but who inspire those who have, through their willful rebellion against Almighty God, made themselves his servants. The mass media - even some Catholic media organs - are deeply complicit in the covering up of the obvious personal defects and subtle doctrinal deviations of this Pope and his overarchingly political agenda, not because they are blind to them wholly, but rather because he is serving their shared purpose, or rather the Devil's purpose, in which they are only too happy to co-operate, namely the destruction of the Church from within and especially the destruction of Christian morals. Be honest, if you hated the Church and Her teachings, would you protest a bad or mad Pope who set out to undermine the very religion you hate? They do not want Christ, they do not want Christianity, they want it expunged from public life and if a faithless and rebellious Bishop or Rome does the groundwork for them within the Church they will be happy to stay silent, especially if he places himself and his personal virtue in opposition to the traditional Church and its traditional evils in the eyes of the world. 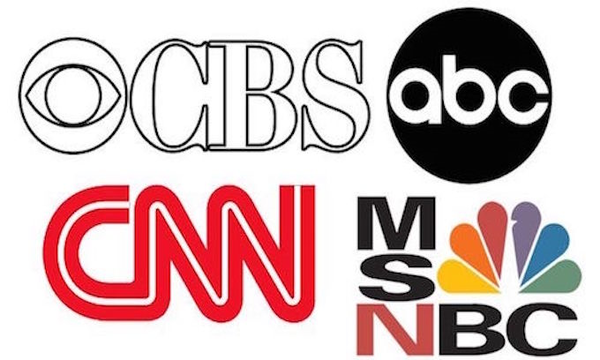 We don't, sadly, live in an age in which the Press are interested in upholding and serving the public with the truth, but an age in which the truth is manifestly resented and hated within public and private institutions, most notably in Government and in the Media, as well as within the Church herself. Pope Francis has brought total anarchy to Vatican City and the institutions of the Church in Rome, his strange teaching wreaking havoc on everything he touches and he is visiting his anarchy upon the Church across the world. I pray very much that the rumour of an oath to attempt to put an end to the resistance to his desired interpretation of Amoris Laetitia is false, but it has got to that stage where it has become clear that those who do resist it are already being called by his favoured so-called 'theologians', 'dissenters'. How long will Francis tolerate dissent to his 'new paradigm'? Will he go for broke and press the nuclear button? What would a dictator Pope do, knowing that through a prestige marketing and PR campaign he could keep the majority of the media onside and rule by fear and by fiat an episcopate and clergy who can, he believes, be easily bullied into submission? Pray for an end to the crisis in the Church, but whatever rank you occupy within the Church, to which the Lord has called you, pray for the endurance and courage to stand firm and publicly for Jesus Christ come what may. We may be approaching the Church's darkest hour, but dawn will come and the Lord Jesus will eventually shed upon the current darkness his radiant light. Look towards Him and be radiant. Those who persevere until the end will receive the crown of life, but for now His servants must endure this bitter crown of thorns. Stay faithful, stay true, stay close to Him, for He will never fail you. Prepare for the worst that Francis can do, and prepare for the best, the very best, that which is beyond our comprehension, which the Lord has promised for He is with until the End of Time. Come, Lord Jesus! Victorious King! Brilliant analysis Bones of this evil in The Vatican.We have an anti-pope in charge causing mayhem and Heresy at every turn.It is so sad that the average Catholic doesn't give a fig about what is going on in The Vatican-which is what one should expect from a dumbed down Church of Nice.The Catholic Faith hasn't been taught in most places for about forty or fifty years.We should expect MOST Priests will go along with the filth that rules The Vatican(the people know nothing anyhow)and Faithful Catholics will move (i already have )to Tradition where strong Catholic Teaching and Catholic Purity is practisedLong live Tradition and Recusant Faith.However it is so sad,so sad.God Bless. This is a very good assessment of what is going on in the Church right now. It has become rather wearying when each of Bergoglio's heretical and outlandish statements is reported with shock and horror; why are we shocked and horrified? He is an imposter who indeed is on a trajectory of destruction of the Catholic Church, and it has been apparent for a very long tome now. From where I am sitting, before very long, the Eucharistic Christ will no longer be found in the institutional Church. The true Church will be underground, where Mass will be offered and the Sacraments will be administered in secret. Each priest, bishop, and Catholic lay person will have to decide whom they are serving: Christ or the evil one. I agree with Bones that the oath of loyalty to the 'person of Francis' will separate the men from the mice, so to speak. Let us pray to the Mother of God for all priests and all Catholics. Soon the rubber is going to hit the road. Ich schwöre bei Gott diesen heiligen Eid, daß ich dem Führer des Deutschen Reiches und Volkes, Adolf Hitler, dem Oberbefehlshaber der Wehrmacht, unbedingten Gehorsam leisten und als tapferer Soldat bereit sein will, jederzeit für diesen Eid mein Leben einzusetzen. And what would be the penalty for refusing to take this oath? Execution on Tower Hill? Given the dire shortage of priests in most areas of the world, would the Pope really want to create a situation where that shortage became far worse? There might even be Bishops and Cardinals who would refuse to take it. Would he risk such a slap in the face? Yes. Your analysis seems accurate. Quite a strategy when you think about it : build upon everyone's expectation to be in union with the Pope as an essential of being Catholic, then make it a conflict to be in union with the Pope. The Pope sounds like a radical secularist which makes it impossible for true well formed Catholics to be in union with him because he mangles the teachings of Christ, mangles scriptural quotes, throws out buckets of sentimentality which appeals to other non formed Catholics, so whatever is left of the well formed Catholics are thrown into angst over whether they are at fault. Those who never were well formed were always off doing their own thing probably from the get go(basically autonomous with a protestant mindset) so they love him because he applauds their open mindedness. The truth in whichever dimension it resides (theology and philosophy) is being suppressed. What foundations have the man-centred religions? The Masonic rite ritual in the above illustration is a house built on sand. 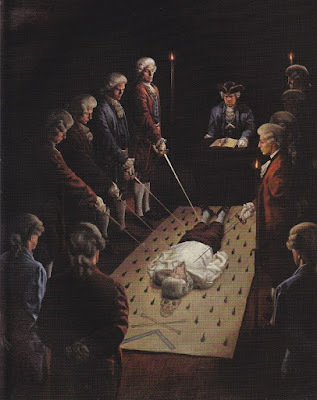 Spiritually dead men cannot sit up and give themselves a blood transfusion, but Masons think they can. The world says that the road to salvation is broad, and many there are that find it. Jesus Christ says the opposite. Just wanted to point out that silence in response to criticism is one of the tried and true methods of the Bolsheviks (along with smear campaigns and various forms of punishment, including death). But this is not a surprising tactic from a Bolshevik Pope, the Judas of the Passion of the Church. Time to get rid of this Pope. Anarchy, indeed. And what a beautiful tune to demonstrate it! As a rather old-ish Trad I am at least glad that for the time being we have the blogs, etc, to help educate the poor laity. Back in the 80s & 90s we had books by Michael Davies and Hamish Fraser, and a few small newspapers. Things may not improve now but I am SO grateful that Catholic men have chosen to defend the Church. Thank you, Laurence! We must be as active as we can be, supported by prayer, to continue the fight. If anyone seeks to impose his will, his own pathological vision, on others, then a lie, or many lies, are dressed up as truth. There is only one Truth, the Incarnate Word of God, the Logos Who was already in the beginning, and will come again raising the living and the dead to judgment. To lie, to distort the truth to suit one's own agenda, is to abandon the Way, and to lose eternal Life, because it is to follow him who is a liar, and the father of lies. If you follow him,you serve him, not God. And then your reaction when your conscience protests is to confirm your attachment to the lie, in every circumstance. Our civilisation was rooted in Christ and lived by Him, and required everyone to be faithful to Him. Many lived a lie, and abused their position over the centuries, remaining in position by ostensible adherence to the Faith for their own ends, but alien to it and the Body of Christ. Modernism is the cancer that has metastasised in our lifetime. Christendom is absent where liars rule. The faithful hunger and thirst for righteousness, and Christ blesses us. The prelates of the Church do not and will not give us the Bread of Life, Christ our God, but already cast us stones of taqqya, the useful lie, ad maiorem diaboli gloriam. The World, which we abjured before our baptism, itself depends entirely on Christ the Truth. Look at any trial, in any country. This world will crumble into chaos very soon, because the Law and Justice, which regulate the structure of civilisation, cannot operate consistently, and cannot maintain any order, where even solemn oaths are taken to confirm pathological lies. This new church is not of Christ Who called through His prophets, "Come out of her, my people." That is what the word Ecclesia means. Those who are called out of the chaos-reverting World. God save you and reward you Laurence, for your beautiful analysis of this pontificate's web of deceit, and anyone who had the patience to read this. It's a wonderful article, IMHO the guy is not Catholic and can't be a Pope, in other words, he's not mine and I'll never be faithful to him. Thanks, Laurence, you're very courageous and a true Catholic. I would be interested to know where you heard such rumours, Bones? However, my response would be: let him bring it on. I am sure that most clergy would sign it - there is plenty of in-your-face-evidence that many do not take their promises, vows and oaths of ordination seriously anyway. But I think he might have an unpleasant surprise by the numbers who would not take such an oath. It feels like Francis and a few like-minded cardinals have decided to rush through a one-man Vatican III but withoutthe tiresome business of convening the bishops. This foul-mouth bully has neutured the CDF and the CDW and the amazing PR machine means that most Catholics don't here about or would be bothered much by the dubia about AL (the new superdoctrine). Sorry to be gloomy but a Pope in the mould of Francis was inevitable. I put a lot of blame onto Benedict. He resigned knowing full well that Cardinal Bergolio had been runner up. If only he had not fled from the wolves. And before that John Paul II with his senseless travelling, huge personality and strong programme helped cement the notion that Popes are absolute monarchs who rule the church and can change doctrine. Hi Bones, this has to be the most powerful summation of the evil we face in holy mother Church that I have read so far and that is considerable! I spotted your comments on Bishop Emeritus Renée Henry Gracida's blog so your message is spreading Stateside. I congratulate you on maintaining a (horrified) balance in your commentary. This is very important and I urge you to do all you can to maintain it for the sake of the credibility of the message you seek to propagate and for your very soul. With very Best wishes . 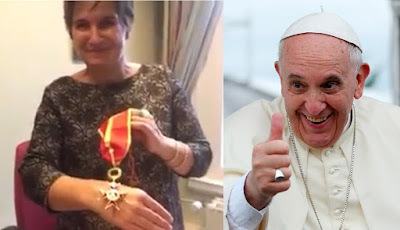 There are rumours circulating that an embattled, deceitful and thoroughly discredited pontificate - at least discredited among faithful Catholics following events carefully - seeks to draw the clergy of the Holy Catholic Church, by coercive means, into a new vow of obedience in particular to Pope Francis and his own 'unique' Magisterium. I agree with Deacon Augustine. Bring it on. It is the logical conclusion to the way things have been moving for centuries. At least it will establish clarity. Everyone will have to decide where they stand.